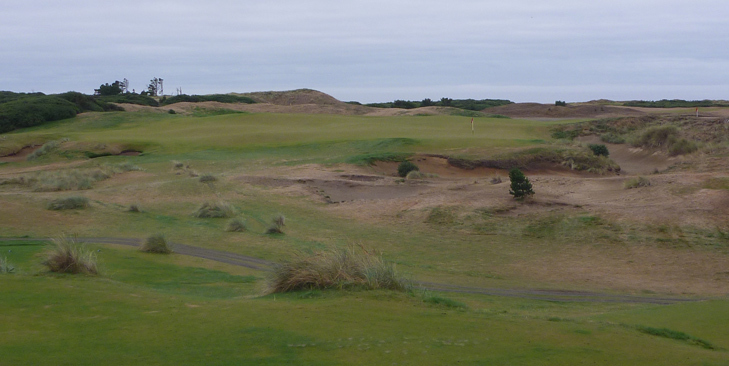 Old MacDonald Hole 1: The first shot of the day is as close to a "freebie" as one gets on a golf course. 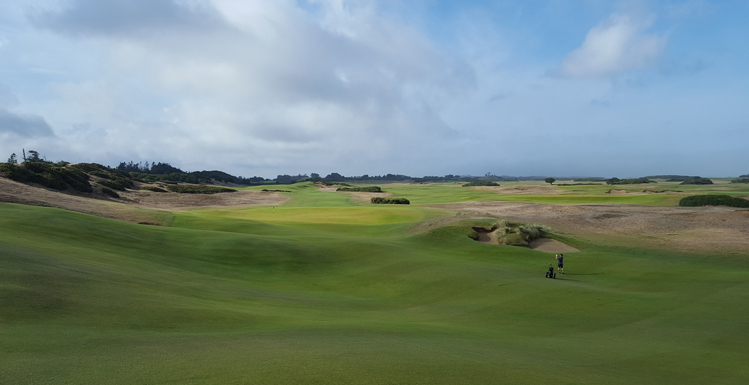 This par four is short and, although sand traps are present, there is so much room to miss them, that the player can pretty much hit anything they want and have a short shot into the green. The green, however, is big and undulating, like most will be all day, so it serves as a needed warmup. Old MacDonald Hole 3 (left and below): After a fairly straightforward opening two golf holes, the golfer gets the first real scare of the day: the blind tee shot on the third hole. With a massive dead tree dead center of the dune, the golfer knows they must hit it high, long and close to the tree, but not into it. 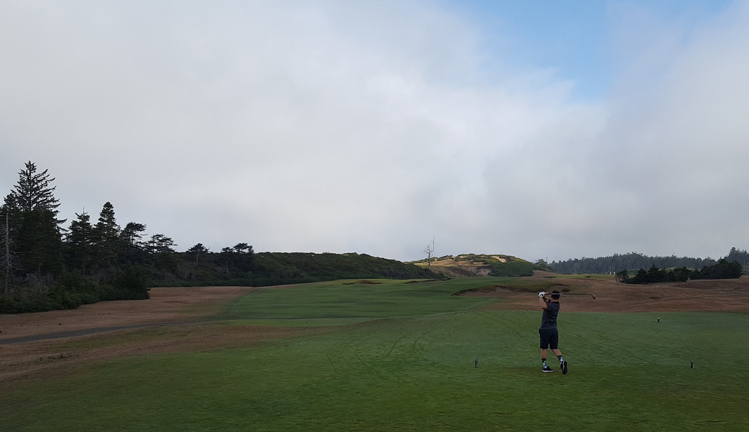 From the plateau in the fairway, the golfer is treated to a very wide fairway and the vista of the rest of the course and the ocean before them before they turn attention to the downhill and extremely undulating green complex. 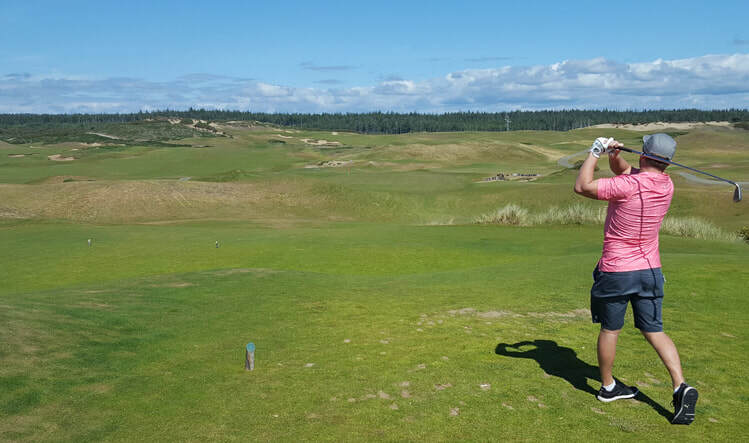 Old MacDonald Hole 4: The "hog’s back" golf hole is an exercise in brutality. At over 500 yards from the tips, this par four is relentless, and that’s after a successful drive that catches the backside of the hog’s back. 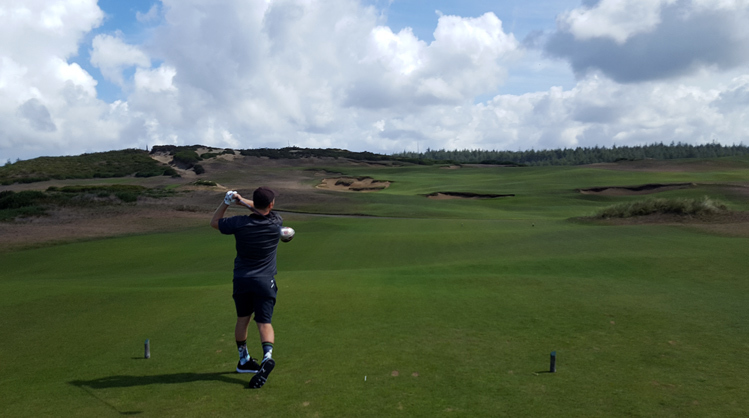 Anything other than perfection on the drive will yield a long second and a tough chance at par. Any pin placement on the far left of the green is practically impossible to get within 30 feet of. Old MacDonald Hole 5: After the brutality of number 4 it is almost cruel to have a short par three to remind the golfer that finesse is also required. This one features a massively wide and deep green with all kinds of tiers and pin placements, demanding accuracy and distance control. 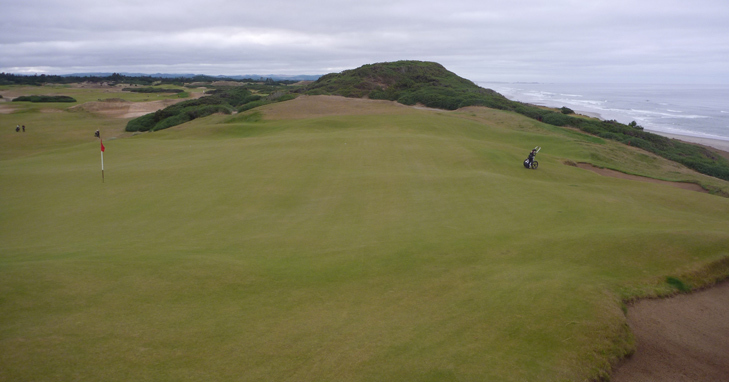 Old MacDonald Hole 7: The signature hole is not a replication but a unique hole with an easy drive followed by an uphill shot to a green fronted by an enormously deep bunker and flanked by more sand and a steep hill heading down towards gorse and the cliffs overlooking the Pacific Ocean. Picture taken from back-right of green. 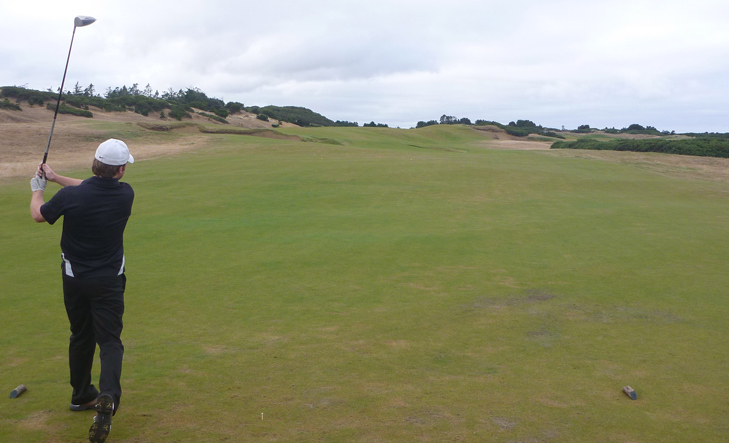 Old MacDonald Hole 8: The "Biarritz" hole is a downhill par three with a massive green. The design element here is the massive sunken dip in the middle of the green that separates the front and back "plateaus" of the putting surface. Club selection is key (and tricky) as the player needs to weigh distance, wind, downhill and trajectory so as to not end up in the wrong section of the huge green. 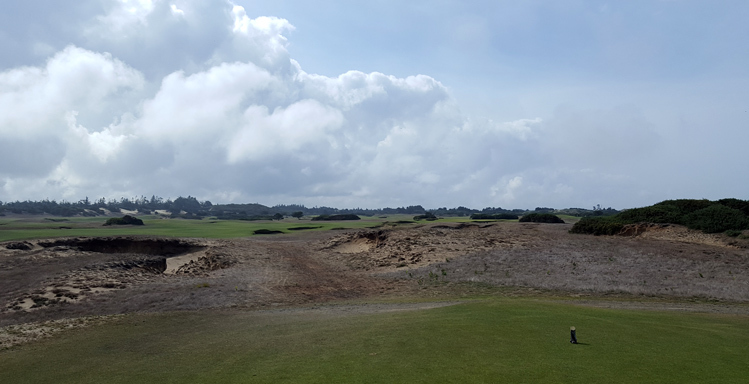 Old MacDonald Hole 9: Not overly long, picturesque or demanding, the ninth is still an enjoyable par dogleg right par four that snakes its way between hard pan and a very large quantity of sand on both sides of the fairway. The green, as usual, has all sorts of humps and undulations. Old MacDonald Hole 11: The “road hole” must be mentioned as a great replica of the second shot of number 17 at St. Andrews Old Course. The tee shot has a dogleg, but it is from an elevated tee, there is no hotel to hit around and there is not actual road or wall behind the green, but the road bunker, although not as deep, does a good job of recreating the angle of the approach shot and choices that the famous golfers have faced in this tribute hole. Old MacDonald Hole 14: This short par four is an uphill dogleg left. The real mistake is to find the bunkers left of the fairway and green. However, from any angle and distance, the green is a tough one, with three distinct levels and shots that miss in pretty much any direction will find very difficult up and downs awaiting them. Old MacDonald Hole 15 (right): This par five is not difficult as long as the golfer avoids the bunkers and gorse right of the fairway on the tee shot as well as the cavernous bunker about 50 yards from the green. That green complex has a stunning view of the Oregon coastline. Old MacDonald Hole 16 (below): Called "Alps" this hole is crafted after the design element found at Prestwick, in Scotland. Here, the hole is longer, and the "mountain" that the golfer has to clear on the second is a bit lower so the player can actually see portions of the green (which is undulating), depending on where they land. Old MacDonald Hole 17: This par five offers a really wide fairway, but for those that want to brave the hazard on the right, they can cut distance and go for the green in two as the only real defense the green has is the large bunker on the left side of the fairway about 30 yards short of it. Played as a three shot hole, it is fairly simple.